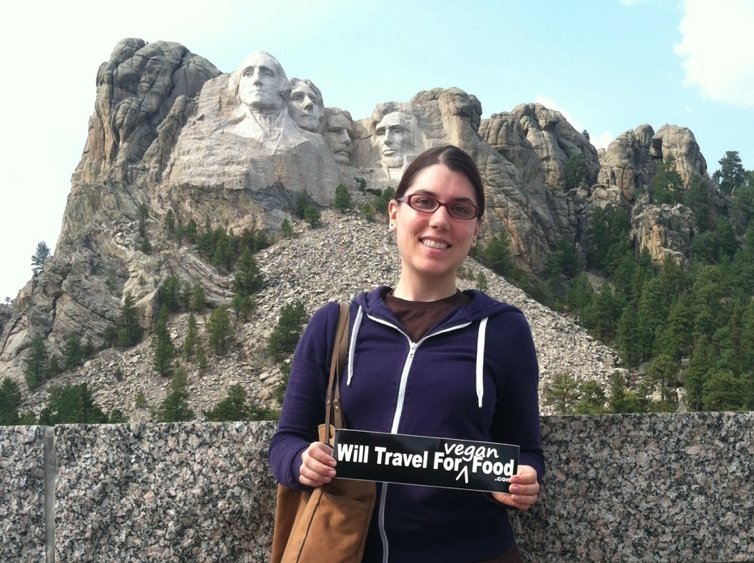 Kristin Lajeunesse Shares her Adventures with Will Travel For Vegan Food! Kristin Lajeunesse isn’t a household name yet, but that’s about to change. Besides riding the fast track to entrepreneurial superstardom with her online business-and-marketing school, this 31-year-old vegan recently landed a book deal to share the story of her amazing road trip to every vegan restaurant in the United States. Here, Kristin shares some of her insights and wisdom about traveling, vegan food, and what’s next. You’ve dined at more than 500 vegan restaurants from coast to coast. Lucky you! Tell us about one memorable meal from your epic journey. One of my all time favorite vegan eateries is Vedge, in Philadelphia. The food was absolutely incredible. I have no idea how Vedge turns seemingly blah vegetables into unbelievably stunning pieces of art. I also enjoyed a fun pomegranate sangria while waiting for the sweet potato paté appetizer. 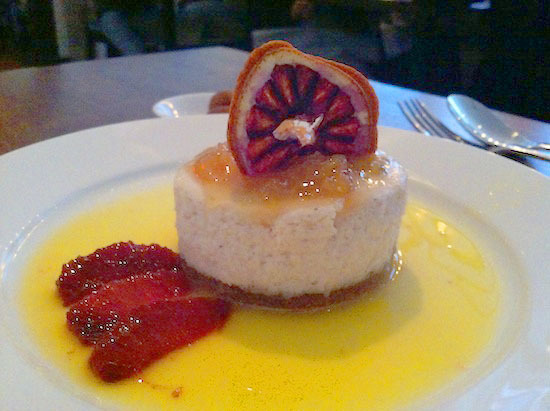 My dinner consisted of thinly sliced mushrooms, crazily flavored lentils, shredded Brussels sprouts, pickled carrots, and—my favorite part of the meal—blood-orange cheesecake. Have Mercy! What resources did you use to find every vegan restaurant you dined in? I was very fortunate to have a spreadsheet from the fine folks over at HappyCow.net listing all of their 100% vegan establishments. Before heading to the next state, I’d plan where I’d go next. After cross-checking that the places were still open and confirming their location and hours, I’d then scope out VegDining.com, then Yelp!, then do a general Google search for the state/city, and finally, I’d post my complete list to the Will Travel For Vegan Food Facebook page to ask my friends if I had missed anything. That’s usually where I got the best and most accurate feedback! What three tips would you offer vegans setting out on a travel adventure who want to eat well, no matter where they are in the world? 1. Always carry an apple. Easy to throw into a backpack or purse, quick to eat at a moment’s notice, and good for you, apples make a great snack. 2. Learn to love smartphones. The smartest investment I made before the trip was to buy an iPhone. When I was in the middle-of-nowhere I would search Yelp! and/or Google Maps for nearby health food stores. I can’t tell you how many times that saved me from having to live off of gas station peanuts for days at a time. 3. Plan ahead for leftovers. Carry collapsible storage containers to put leftovers in. I saw one of my friends post this really cool, easy to carry, microwave safe and bpa-free collapsible container by Aladdin. What a great way to eat up your leftovers and save money on the next meal, too! You’ve recently launched an online business school; is it specifically targeted toward vegans? Yes, the Creating Freedom + Mastery video training series just opened last week! While it is not specifically targeted toward vegans, I’m definitely sharing it primarily with the vegan community because that’s where my reach is, and that’s who I engage with on a daily basis. Plus, if I can help vegan-focused business owners, bloggers, entrepreneurs, musicians, artists, creatives, you name it—then all the better! When can we expect to get our hands on your new book? 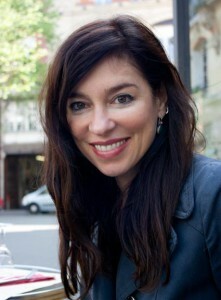 I’m hoping the book will be released by this fall/winter. I’m really looking forward to sharing the personal side of the journey, which is something I didn’t talk about as much in the blog (which has mostly been about the food itself). And you can bet I’m planning an epic book tour around its launch so be on the lookout for autumn 2014 updates!